1. Available for cars with OBD2 and EUOBD port (Car automatic diagnosis system), plug and play. 2. 5.8" HD display screen. 6. Rich Contents: speed, rpm, water temperature, voltage, instantaneous fuelconsumption, average fuel consumption, driving distance measurement, voltage, shift reminders, fatigue driving reminders, low voltage alarm, high water temperature alarm, over speed alarm, engine failure alarm, eliminate the fault code, freely switch between kilometers&miles. 7. Auto power on/off: HUD start and off with vehicle started and shutdown, effective protection of the car battery; retaining the manual switch mode,more easy to control HUD. PLUG AND PLAY: Available for cars with OBD2 and EUOBD port (Car automatic diagnosis system), 5.8 inch HD display screen. THE NEWST FUNCTION: Driving distance measurement. 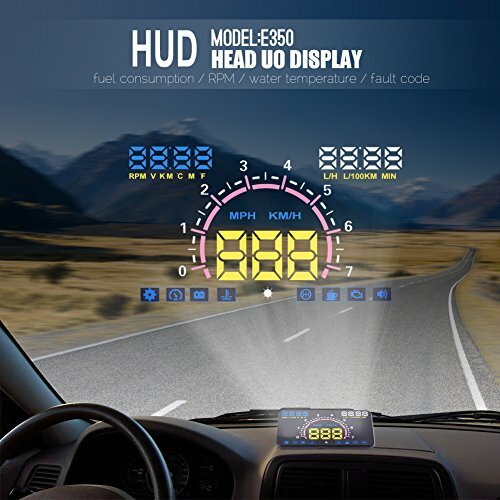 Auto power on/off: HUD start and off with vehicle started and shutdown, effective protection of the car battery; retaining the manual switch mode,more easy to control HUD. RICH CONTENTS: Shows speed, rpm, water temperature, voltage, instantaneous fuelconsumption, average fuel consumption, driving distance measurement, voltage, shift reminders, fatigue driving reminders, low voltage alarm, high water temperature alarm, over speed. TWO MODES & Multi-color design: Automatic and manual brightness adjustment mode, driving without glare,Nano-technology to eliminate double reflections, more clear,more abundant and easier to read. GUARANTEE - If you are not satisfied with our product received, you can apply for unconditional return and refund in the valid period(180 days). In terms of any problem of this product, you can send emails to us at any time. We will be the first time to reply you.